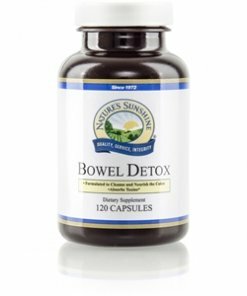 Nature’s Sunshine Bowel Detox promotes the natural cleansing of the digestive and intestinal systems, including systematic removal of waste from the colon. 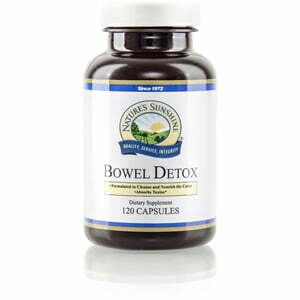 Bowel Detox includes 24 mg of both betain HC1 and bile salts as well as 108 mg of pancreatin. Combined with an herbal base of psyllium hulls, algin, cascara sagrada bark, ginger rhizome, apple pectin, parthenium root, charcoal, marshmallow root extract, sodium copper chlorophyllin and bentonite clay, these nutrients provide enzymes the enhance digestion and promote proper waste elimination. Instructions: Take two capsules with morning meal and three capsules with evening meal daily.